History: Just after second semester was underway in 1962, sophomores, juniors and seniors at Bellevue Junior/Senior High School, located at what is now Mission Middle School, prepared to move to a new high school, which was then called Bellevue Senior High School. The three story building housed all students until the second and third phases and the gymnasium were completed with two outdoor courtyards in 1963. A decade later an auditorium and a swimming pool were added. The auditorium is the largest auditorium for the Bellevue/Offutt Community. The indoor swimming pool was Bellevue’s first. Many other major additions and remodeling continued for the next 42 years. 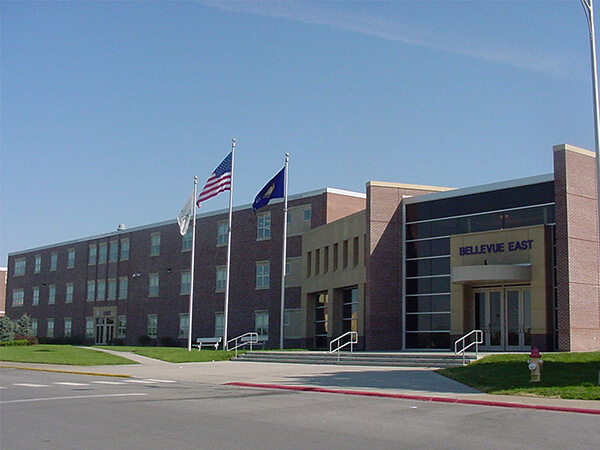 In 1977, Bellevue Senior High School was divided to create the present Bellevue East and Bellevue West High Schools. School Purpose: Bellevue East High School will achieve excellence by establishing and maintaining high expectations. Work is continuing at Bellevue East with Lueder Construction and the Ray Martin Company working through the various phases of construction for the revamping of the heating and cooling systems at Bellevue East High School. 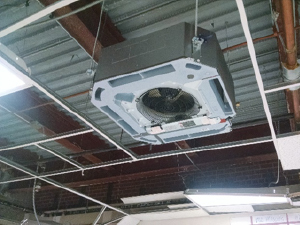 The existing steam and chiller systems within the building are being replaced with a new Variable Refrigerant Flow (VRF) heating and cooling system, which should prove to be a highly efficient mechanical that should provide significant energy savings to the District in the coming years. A significant amount of the classroom areas in the building have had the new units installed with work now moving into some of the larger open areas of the building (e.g. gyms, band rooms, common areas, etc…). A significant amount of work was completed in the Summer of 2018 with another significant amount of work scheduled over the Summer months of 2019. It is anticipated that work should be completed on this $8.2 million project in early fall of 2019. A roofing project over the north gym area of Bellevue East was recently completed which replaced the existing roof system over the gym. A persistent leak in this area accelerated the scheduling of the roof replacement and activities are now being completed in a dry environment. A larger roof replacement project for the building has been awarded to McCoy Construction for the replacement of various areas of roof systems around the building. This roofing project is being started in July of 2018 and will be completed in early Spring of 2019. Scheduling of work has revolved around ongoing school scheduling of students within the building and is being coordinated with the cooperation with the school administration. Another separate roof project will be completed in replacement of the roof system over the main competition gym area. The work on this replacement will start in June of 2019 should be completed around September 1st (weather dependent). 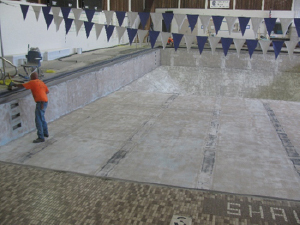 Work was completed on some miscellaneous maintenance work within the pool area at Bellevue East. 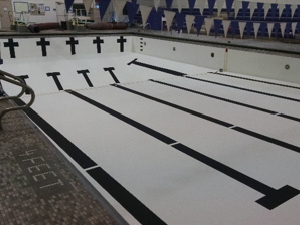 The scope of work included refinishing of the pool finishes, installation of new starting blocks, installation of handrails in the seating areas, installation of slip-resistant flooring in the spectator walk areas, and miscellaneous pool equipment modifications. Additional work is scheduled in the pool area in the Summer of 2019. This work will include the installation of a new pool ventilation system and replacement of the existing lighting system within the pool. It is anticipated that work in the pool area will be fully completed by early August of 2019. Renovations are planned in 2019 for the track at Bellevue East. The existing rubber surfacing at the track is at the end of its life expectancy and is starting to deteriorate. The existing rubber surfacing will be removed and replaced with a new black crumb rubber running surface. Minor repairs will be made to the existing asphalt surfacing underlayment prior to the installation of the new surfacing. Work is tentatively scheduled to begin in mid-May 2019 and is anticipated to be completed in mid-Summer 2019. Work is ongoing with Lueder Construction and the Ray Martin Company on the first phase of construction for the revamping of the heating and cooling systems at Bellevue East High School. The initial phase of the work involves a number of classrooms towards the east-central core of the building as well as the general shop and industrial arts area of the building. A significant amount of work will be completed this summer on the $8.2 million project. Work on the project will be ongoing during the 2018-2019 school year. 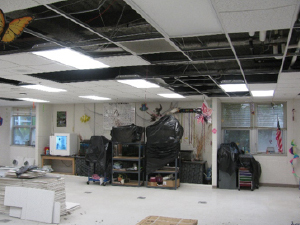 Approximately 5 to 6 classrooms will be taken off line with students being relocated in the building during the school year to allow the HVAC renovation work to proceed during the year. After dismissal of the school year in the Spring of 2019, a significant amount of work will be going on again within the building to try to finish all of the work prior to the start of the 2019-2020 school year. A roofing project over the north gym area of Bellevue East was recently completed by 10 Men Roofing, Inc. which replaced the existing roof system over the gym. A persistent leak in this area accelerated the scheduling of the roof replacement and activities are now being completed in a dry environment. A larger roof replacement project for the building has been awarded to McCoy Construction for the replacement of various areas of roof systems around the building. This roofing project is being started in July of 2018 and it is anticipated that some of the roofing work may extend into 2019. Work will be completed in consideration of students that are within the building and will be coordinated accordingly with the school administration. Trophy Construction is continuing work to complete miscellaneous maintenance work within the pool area at Bellevue East. The scope of work will include refinishing of the pool finishes, installation of new starting blocks, installation of handrails in the seating areas, installation of slip-resistant flooring in the spectator walk areas, and miscellaneous pool equipment modifications. It is anticipated that the work with this project will be completed by August 2018. Another separate roof project will be completed in replacement of the roof system over the main competition gym area. The work on this replacement will start in July 2018 and should be completed around September 1st(weather dependent). The Bellevue School Board approved at the May 2018 Board meeting a contract with Trophy Construction to complete miscellaneous maintenance work within the pool area at Bellevue East. The scope of work will include refinishing of the pool finishes, installation of new starting blocks, installation of handrails in the seating areas, installation of slip-resistant flooring in the spectator walk areas, and miscellaneous pool equipment modifications. It is anticipated that the work with this project will be completed by August 2018. The Bellevue School Board has awarded a Contract to 10 Men Roofing, Inc. to complete the replacement of the existing roof system over the North Gym area at Bellevue East. Work on the project was started in early April and the roofing work for this building wing has been completed. Bids have been received on two other roof projects at Bellevue East. The existing roof over the main gym area is scheduled to be replaced in the summer of 2018 and will be completed by Bradco Company. Another project includes multiple roof sections that will be heavily tied to the concurrent HVAC project. A number of new rooftop units and pieces of mechanical equipment will be placed on the roof and roof areas identified as high priority replacement areas will be replaced in conjunction with the HVAC project. This project has been awarded to McCoy Construction Company and work will be completed in 2018 and extending into 2019 and will be coordinated and phased in with the concurrent HVAC project. Bids were received on March 26th, 2018 for the proposed renovation of the heating and cooling systems at Bellevue East High School. Some early previous estimates for the renovation and replacement of the existing system was anticipated to put the cost of the replacement at around $11 million. Bids on the project actually came in much lower than what was anticipated at $8.2 million. The Bellevue School Board voted on April 2nd to proceed with the project and award the project to Lueder Construction Company. Work on the project will begin in late May of 2018 after the end of the school year. The early estimates on the construction timelines puts completion of all of the work sometime in late 2019. Work will be phased through the building during the 2018-2019 school year with the 2018 and 2019 summers focusing on a lot of the major work. Advanced Engineering Systems (AES) is continuing with preparation of plans for the planned HVAC renovations and upgrades at Bellevue East High School. It is anticipated that AES will present updated plans to the School/District staff in early January as they proceed with a timetable to have bidding documents available for bidding in March of 2018. The current plan is to replace the existing steam boiler heating and chiller cooling systems currently found within the building with a variable refrigerant flow (VRF) system. The decision to proceed with this installation was made after reviewing a number of heating and cooling options where initial costs and long term operating/life cycle costs were weighed between the options. While the initial costs on the installation of this system is substantial, the system provides the most efficiency in terms of energy efficiency and operating/maintenance costs which should provide a substantial savings to the District over the life of the HVAC system and the remaining life of the building. The VRF installation will also provide better individual room temperature control and hopefully a better learning environment within the classrooms. It is anticipated that construction will start in late Spring of 2018 and construction could last for upwards over a two-year time window depending on how the work can be phased during school years. Additional information will be forthcoming as soon as plans are better developed. The Bellevue School Board has awarded a Contract to 10 Men Roofing, Inc. to complete the replacement of the existing roof system over the North Gym area at Bellevue East. It is anticipated that work on the project will begin in late February or early March once weather conditions permit the start of the work involved with the project.